Dual HP Flat Panel LCD Monitor 24"
The Matrox Axio family of HD and SD platforms provides a complete post-production solution that lets you get the best from the Adobe CS3 Production Premium software. The Axio platforms are designed to give you the most comprehensive realtime feature set, the highest quality native codec technology, and complete file-based workflows – totally integrated with the Adobe software. There are three Matrox Axio platforms to choose from, Matrox Axio HD, Matrox Axio SD, and Matrox Axio LE. 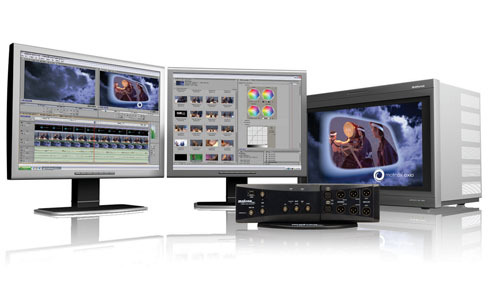 All offer ultra high performance editing in HD and SD formats. They differ only in terms of the editing codecs supported, the method of performing Matrox Flex GPU effects, and the audio and video inputs and outputs provided on the breakout boxes. The Matrox Axio software and hardware components are integrated into an approved workstation and sold through a network of Matrox authorized resellers. These resellers also provide installation and training services to customers worldwide.